At the office of Dr. Charles C. Harrington, our mission is to help patients of all ages achieve a beautiful, healthy smile through comprehensive orthodontic treatment. Our trusted orthodontist works individually with each and every patient, designing personalized treatment plans that fit into your lifestyle and make the orthodontic treatment process convenient. But whether you choose braces, Invisalign, or any other treatment we offer, you'll need to wear a retainer once you finish the active portion of your treatment. When you get your braces off or finish your Gaithersburg Invisalign treatment, we know how ecstatic you'll be. After all, you've finally achieved your beautiful new smile! But hold on a minute, because you're not quite out of the woods yet. Now begins the retention phase of treatment, and it's one of the most important parts of ensuring your smile lasts a lifetime. At the end of the active phase of your treatment, your teeth will be in new positions, creating a brand new smile. However, the tissues, ligaments, and bones that support your teeth have yet to adapt to these new positions. This means that left on their own, your teeth will slowly migrate back to their original alignment, erasing your new smile and all your hard work! Retention therapy allows us to prevent this regression and safeguard your smile for a lifetime. This involves wearing an orthodontic retainer, an orthodontic appliance designed to keep your teeth where they are until the rest of your mouth has time to adjust. By following your orthodontist's instructions carefully and wearing your retainer diligently, you can cement the new alignment of your teeth and enjoy your new smile for years to come! 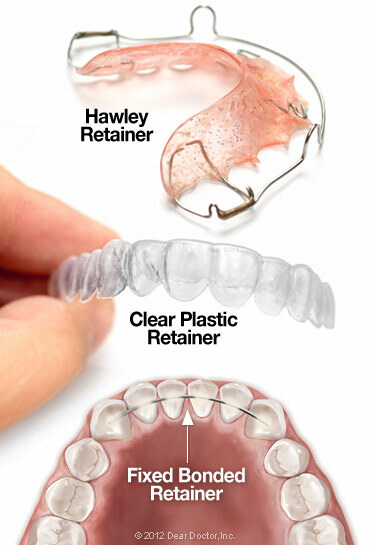 Hawley Retainers: The Hawley is the most common form of retainer and works well for just about any patient. Made from a piece of acrylic molded to fit your mouth, it contains thin metal wires that protrude from the acrylic and wrap around the teeth, holding them in place. The Hawley retainer is durable, effective, and versatile, making it a common style for patients of both braces and Invisalign. Essix Retainer: Another retainer style is the Essix retainer, or clear aligner type. These are very similar in form to Invisalign aligners: they're made from a thin piece of clear, molded plastic that fits directly onto your teeth. Also similar to Invisalign, Essix retainers are virtually invisible when worn and easy to take out, making them convenient for patients who need to wear their retainer longer or more frequently than others. Fixed Retainers: The final option, called a fixed or bonded retainer, is a little different than the other two. As the name implies, fixed retainers are just that: they're bonded to the teeth with dental cement and can't be removed. However, fixed retainers are made only from a single metal wire that sits behind the lower front teeth, making them completely invisible from the outside and causing little impact on daily life. Fixed retainers are ideal for patients with a high risk of tooth regression and can be kept in place for months or longer to safeguard your smile. Similar to when you first got your braces or started your Invisalign treatment here in Rockville, you'll likely experience a small adjustment period when you first start with your retainer. During this time, you may notice a slight lisp in your speech or that your mouth salivates more than normal, but don't worry: these issues are usually minor and fade within a week. At first, you'll probably need to wear your retainer 24/7, and this constant wear will last anywhere from a few months to a year. Once your Rockville orthodontist gives you the go-ahead, you'll switch to wearing your retainer only at night, and eventually, you'll only need to wear it a few nights per week. Just like braces, your retainer – whether removable or fixed – needs to be carefully cleaned to keep it fresh and protect from dental decay. If you have a Hawley retainer, you can simply brush it as you do your teeth. Essix retainers can be scratched by regular brushes, so make sure to brush lightly or use denture cleaning tablets. To clean fixed retainers, you'll brush and floss your teeth normally, but you will need to use a floss threader to get under the retainer. When we first give you your retainer, we'll also provide a purpose-made case to carry and protect your retainer – and it's critical that you use it! Countless patients accidentally wrap their retainer in a napkin and throw it away, necessitating costly replacements, so always make sure to use your retainer case. Finally, avoid exposing your retainer to hot water or any excess heat source, as this can cause it to warp. Contact Your North Potomac Orthodontist! With proper wear, your retainer will protect your new smile and ensure you can enjoy it for years to come. Feel free to contact us if you have more questions about retention, or if you'd like to pursue a new smile for yourself, simply request an appointment using our easy online form. We can't wait to hear from you, and we look forward to helping you achieve the smile of your dreams!